The holidays are such an enchanting time of year — especially because they involve making your space look festive to the max. So, if your guest list and menu are already set and the bar cart is stocked, now all you need is a little inspiration to deck out your holiday dinner table in style. 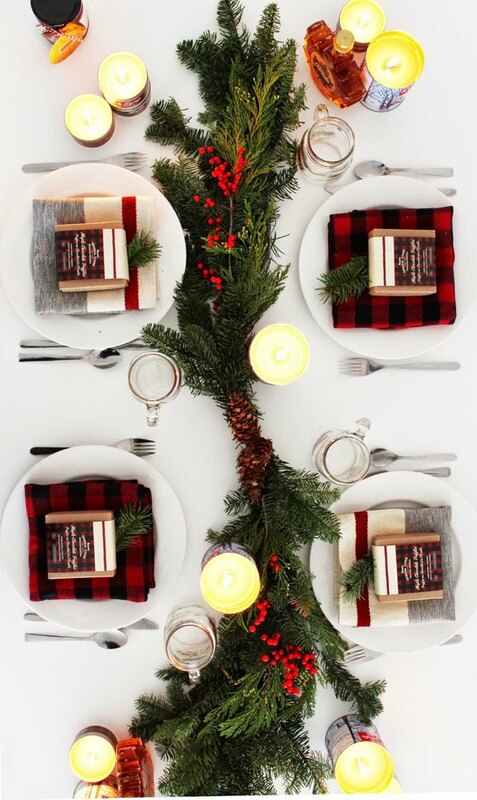 Try one of these 14 festive tablescape ideas to make your holiday fete merry and bright. If you live in LA like Sarah Sherman Samuel, move your dinner party outdoors. Being surrounded by nature while you feast on your holiday favorites will make your Christmas soiree a magical night to remember. Layer different textures and add a dash of sparkle with decorative accents like wire brush trees, gold chargers and candlestick holders, and faux fur throws used as seat cushions. Don't have a fancy table runner? No worries! 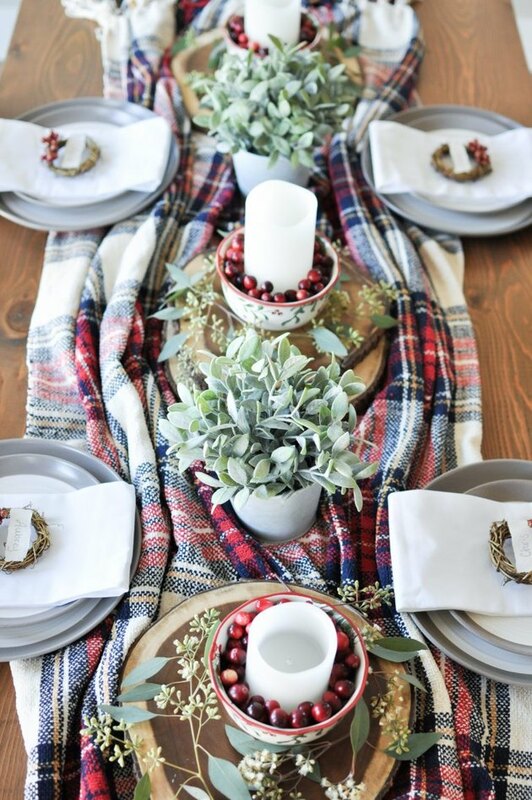 A plaid flannel print blanket works just as well and it's also a great way to add a warm, cozy texture to your Christmas tablescape. Pair with cranberry-filled votive candle holders atop wood slice chargers, and throw in some seeded eucalyptus for a little greenery. And to make this holiday celebration even more joyous, use mini-wreaths as place card holders. 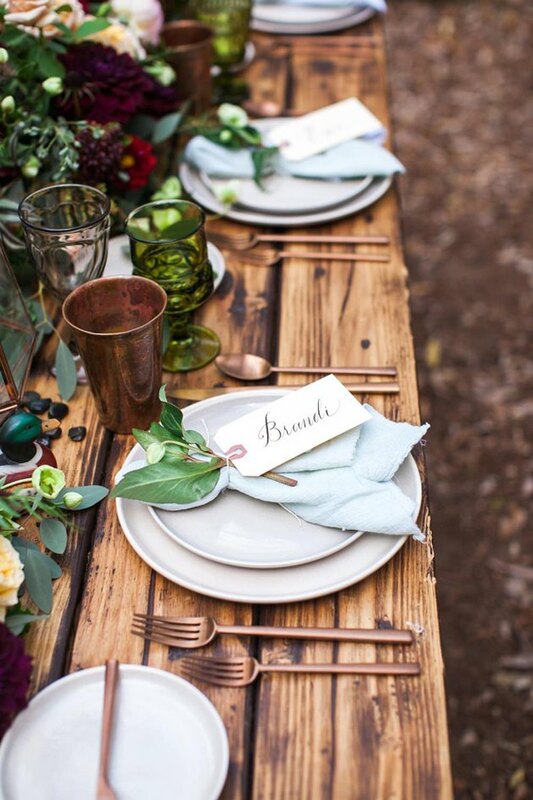 How charming is this idyllic tablescape? Not to mention fast and easy. 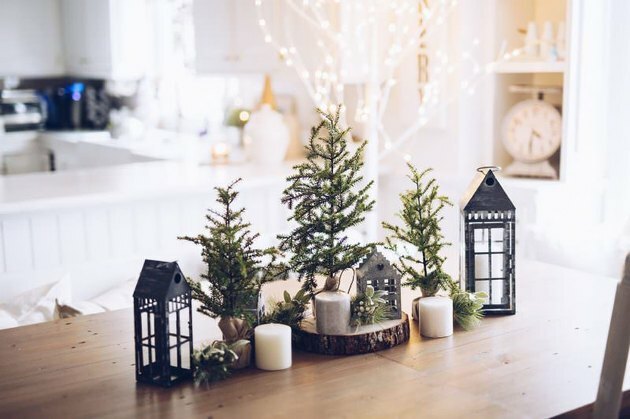 Lynzy & Co. created this cozy scene with a few mini-pine trees, house-shaped lanterns, votive candles, and a rustic wood slice charger. We just love the cabin vibes of this candlelit dinner. The comfy Buffalo plaid and knit tea towels become napkins while evergreen boughs of holly beautifully wind their way down the table giving off that Christmas tree aroma we all love and adore. Throw in a few maple-scented candles to get everyone's tastebuds watering. You can buy these yummy maple smelling delights, or challenge yourself to a fun DIY candle-making project. 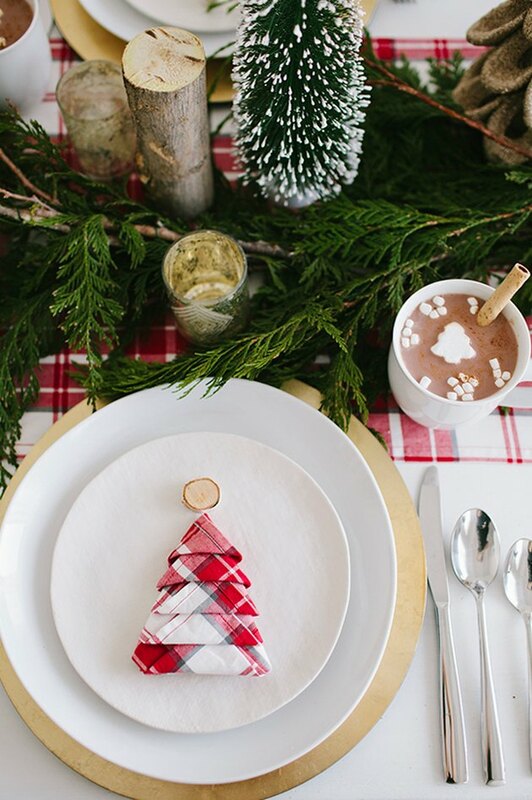 100 Layer Cake co-founder Amanda Dawbarn is the creative genius behind this holiday goodness. 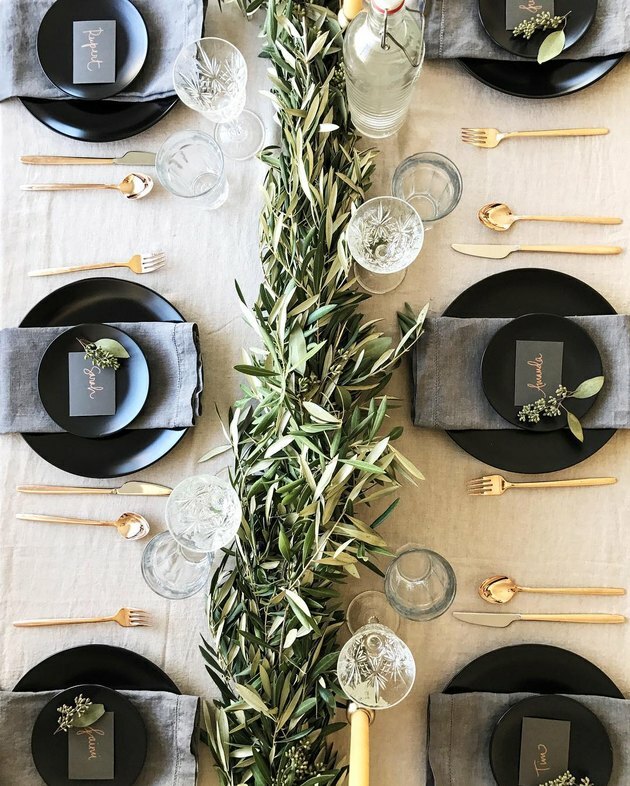 The lush green olive branch garland running down the center of the dining room table is the star of the show, while the chic black dinnerware complemented by gold cutlery from Crate & Barrel makes a stellar supporting cast. This lovely tablescape proves that keeping the doctor away isn't the only thing that apples are good for. 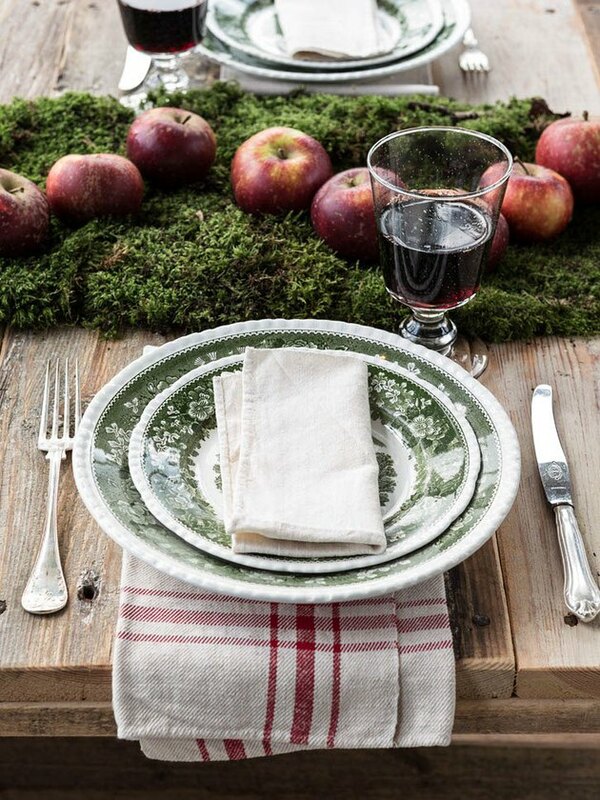 Mouthwatering red apples cleverly paired with green moss, red and white plaid napkins, and green floral print dinnerware are a subtle yet festive approach to traditional holiday decor. The rustic wood table provides the perfect backdrop for this sweet farmhouse-style dinner party. Surrounded by the outdoors, Darling Event & Co.'s delightful nature-inspired fete exudes romantic elegance. The rich vibrant jewel-toned color palette, fresh gorgeous blooms, and shimmering copper details work together to create a dining experience your guests won't soon forget. How amazing would it be to savor your holiday feast under the light of the stars? This Christmas party did just that in a greenhouse warmed by a crackling fire, while enjoying floor to ceiling views of the snow-covered outdoors. 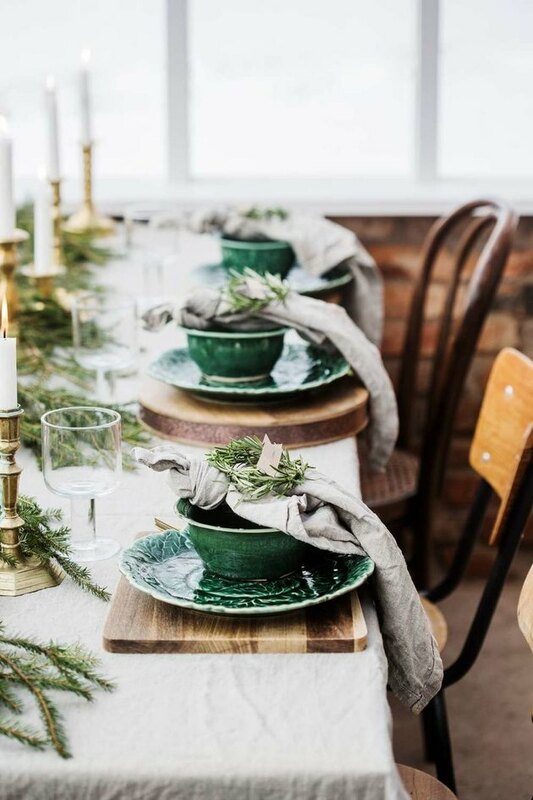 Charming dark green dinnerware balance natural embellishments like wood slice chargers, a pine tree branch centerpiece, and mini-rosemary wreath place card holders to make the season bright. Now this is how to do the all-white trend right! 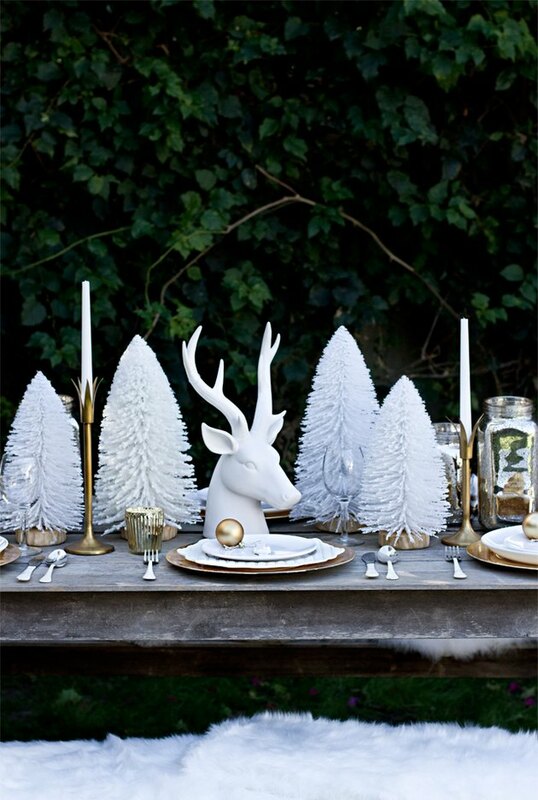 Homeyohmy's monochromatic holiday tablescape is simply stunning. Natural ornamentation such as floral greens, elegant fresh flower arrangements, and suede lace napkin ties add subtle, yet dreamy pops of color that we just adore. 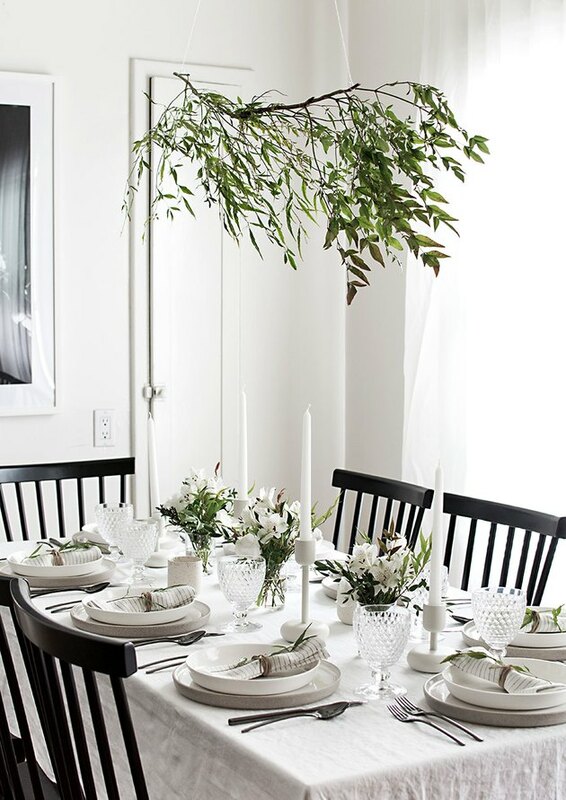 And the pièce de résistance: leafy tree branches exquisitely suspended above the dining table. This magical woodland-themed dinner is a candlelit affair to remember. 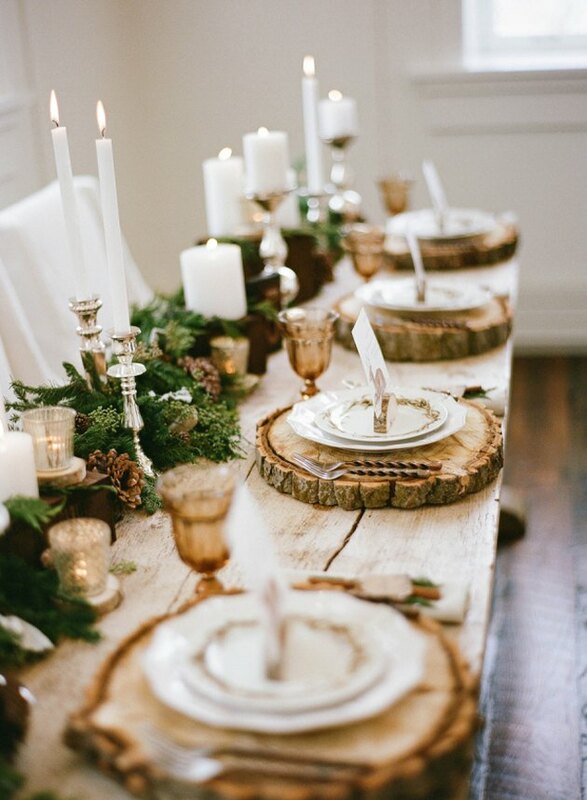 The long, rustic dining table features a stunning evergreen and pine cone garland centerpiece. The wood slice chargers, with matching mini-wood slice place card holders, are lit by tall taper candles and smaller votive candles, while the cloth napkins are accented with a cinnamon stick along with a pine tree sprig. The holidays are a time for giving, and we just love the beautiful way in which 100 Layer Cake did just that. 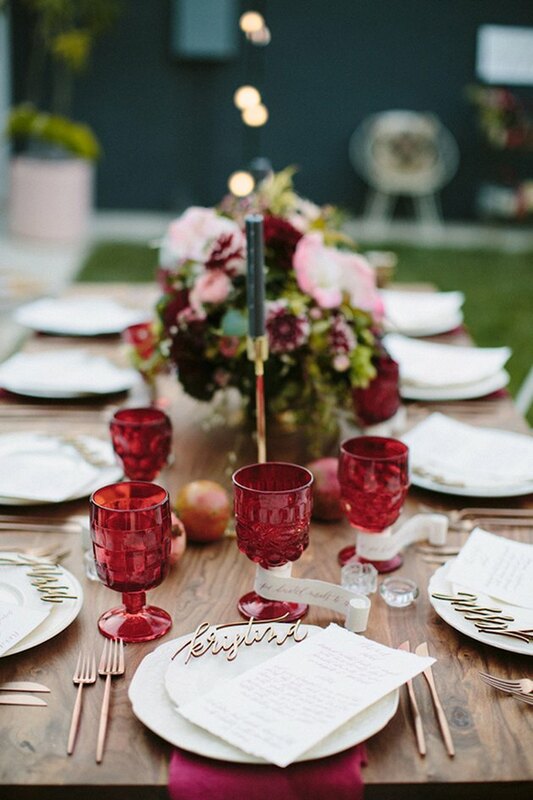 They hosted an enchanting outdoor dinner party to raise money for FEED Projects and we're swooning over every gorgeous detail. From the jewel-toned goblets, to the laser cut wood name tags, to the rose gold flatware, to the hand-scripted menu, and finally the exquisite arrangement of fresh flowers in the center of the table — we just can't get enough of this merry bash! Minimal in design, yet high in style. This stunning Scandinavian-inspired tablescape is a festive sight to behold. 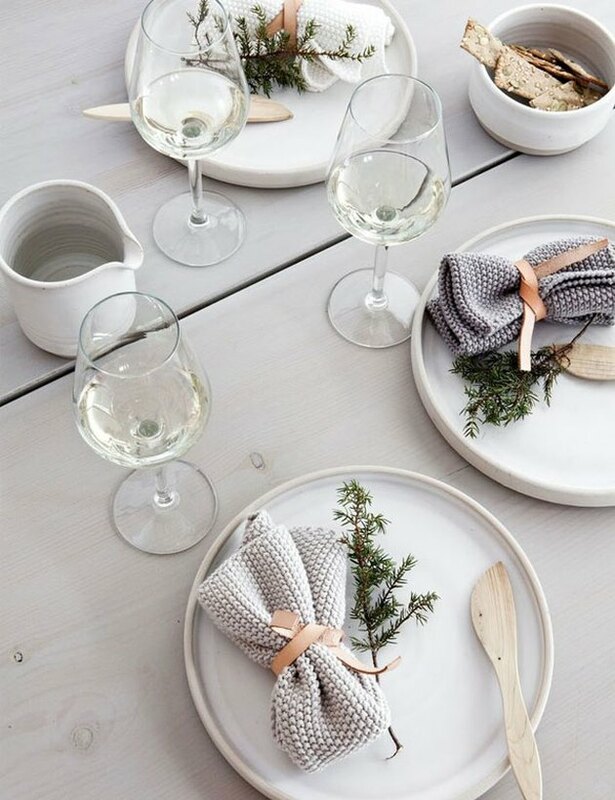 The soft neutral color palette of cool gray and white hues is complemented by a natural wood utensil and a delicate pine tree flourish. Yes, you can absolutely have a millennial pink tablescape for Christmas. 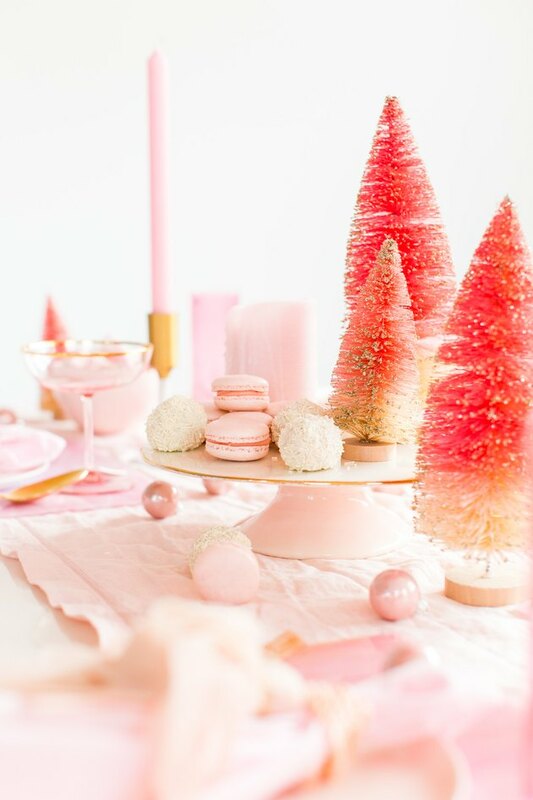 This perfectly pink holiday spread created by Sugar & Cloth will leave "visions of sugar plums" dancing in your head. This rustic-glam Christmas tablescape by Little Peanut is just as sweet as can be. The plaid table runner and matching napkins make a charming backdrop for the lush green centerpiece made up of cedar branches, bay leaves, and pieces of wood. Complemented by the glistening metallic gleam of gold chargers and votive candle holders, the adorably festive details — napkins folded into the shape of trees and cups of hot cocoa topped with tree-shaped marshmallows — really stand out.